We often encounter law firms struggling with what to post on their firm Facebook pages. 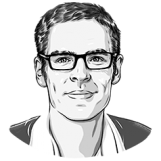 Because Facebook is not a dedicated professional platform (like LinkedIn), many lawyers are understandably cautious of allowing their personal and professional lives to overlap. While the merits of having a firm Facebook page are certainly up for debate, their visibility in search engine results should be well worth the effort. While Skunkworks regularly builds branded Facebook pages, we don’t supply the content. We do recommend that Facebook be used to show the “human side” of the firm, but we leave it to them to express their own personality. 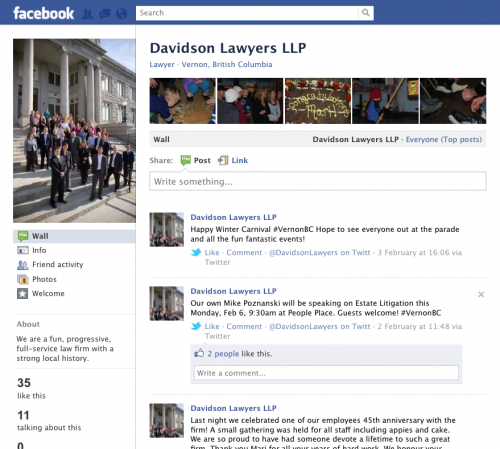 Our friends at Davidson Lawyers LLP in lovely Vernon, British Columbia have an excellent social media presence. In particular, they regularly update their Facebook page. While we played no role in setting-up their branded Facebook page, it is a good example of what type of content firms can offer.